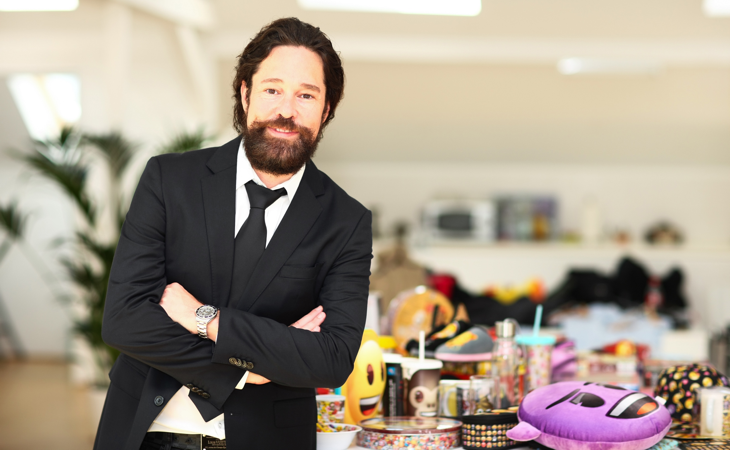 As we move well into the new year, and with the licensing industry ever-changing, we had the chance to sit down with Marco Hüsges from the emoji company to talk about his plans for his business both globally and in Australia. With the appointment of Merchantwise as the new local licensing agent for the emoji company in Australia, we also had the chance to speak to Alan Schauder to learn about his plans for the brand. Marco, what have been some of the most exciting developments for you and the emoji company over the past year that you can share with us? 2017 was a tremendous year for the emoji® brand. We executed about 250 new license agreements. We have been rated the third most influential brand in the industry. We entered into agreements with Ferrero and Nestle for water bottles on a global basis and signed an exclusive partnership with Walmart Photo Center in Canada; just to name a few of our new strategic alliances. Our product portfolio has become incredibly large and we have seen products in categories way beyond standard licensing business. The work with our various licensees from all around the world is highly inspiring for us and we constantly focus on the development of new product lines such as our new collectible toy line that is launching in 2018. On top of that our content has been licensed and used for many marketing campaigns in print or online as well as for TV commercials for firms such as Orange France or Opel. Last time we spoke to you Marco, there was talk of moving into even more new regions! How has this developed since we spoke to you in October at Brand Licensing Europe? Indeed, we have signed new agent agreements in Eastern Europe and several Latin American countries. Our business in the Middle East is expanding fast as well as in China which we see as one of our main markets. In China we are launching exciting brand collaborations with companies such as Kipling, Zippo or f.e. Listerine. Marco, I believe that you can now get an official emoji credit card? Can you tell us about this new and very unique initiative from the emoji company? That is correct. We recently launched official emoji® credit cards with Russia´s biggest bank – Sberbank. Every single person in Russia has Sberbank cards or an account and now all Russian people are able to obtain the branded emoji® credit card with their mood and self-expression. The emoji® credit cards already became the most successful project for Sberbank among all licensing projects within the personalized cards segment. The emoji® cards are now available in 10 designs and Sberbank is already planning to create more designs for 2018, including designs for football. Marco, what are the main global objectives for the emoji company for 2018 and what can we look forward to? As in the previous year we have multiple strategic and high level partnerships that will drive the global emoji® brand recognition. Licensing initiatives that will surely push the emoji® brand in 2018 are collaborations with Ferrero, Nestle, Burger King, Unilever, La Poste France, Toy Plus amongst multiple others. We have created more than 10.000 copyrighted icons, patterns and characters available for legitimate licensing. The emoji company now offers more than 60 style guides that demonstrate the beautiful and varied world of emoji®. Working with the emoji® brand means year-round potential, variety and diversification for a non-gender specific target group of all ages – that is an outstanding USP of our brand and makes it so unique and compelling. Marco, from an Australian market perspective, what does the recent appointment of Merchantwise as the licensing agent in Australia mean for the emoji company? We are pleased to be working with Merchantwise, a licensing agency with a strong reputation for building innovative licensing and promotional partnerships in Australia and New Zealand. We believe that Merchantwise will bring great focus to the emoji® licensing program in this part of the world. Merchantwise also has good creative and digital marketing capabilities to support our licensing and retail partners. Alan, what will be the main objectives and goals over the next year and beyond to further develop the official emoji® brand in Australia? The initial priority is to further establish the brand at retail in core categories such as apparel, accessories and homewares. These are categories which sell very well worldwide. emoji® is a very flexible brand for retailers seeking to do eye-catching digital and in-store retail activations. The next priority is to develop new advertising and promotional partnerships with consumer brands wanting to capitalize on the universal language of emojis with consumers of all ages. Alan, Amazon has now established their operations here in Australia; will this be a focus for the emoji company, Merchantwise and your partners in bringing product to Australian consumers? Certainly Amazon is a priority for most licensing and consumer products programs these days. While it is still quite new in Australia, I understand that many Australian licensees are already embracing Amazon, gearing themselves up to meet Amazon’s supply chain requirements. We will also be reaching out directly to work with the local Amazon team on some direct marketing and promotional activities. Alan, with Australia being a smaller market than many of the larger markets that the emoji company operates in; what are the most important considerations when creating brand awareness and activations here in our market? Australia may be smaller in terms of population, but it is a sophisticated market with switched on consumers who follow the latest trends in technology and social media. Our latest brand research from Australia shows that emojis are already known and liked by well over 90% of both adults and children, exceeding the popularity of most leading licensed brands. That is already a great platform for brand development.